…between the gentleman on the right and yours truly in purely coincidental. Okeh, I’ll admit it, I play bass guitar in Blue Moon. My band mates have wondered why I hesitate to promote our band on this website and so I finally succumbed to peer pressure. 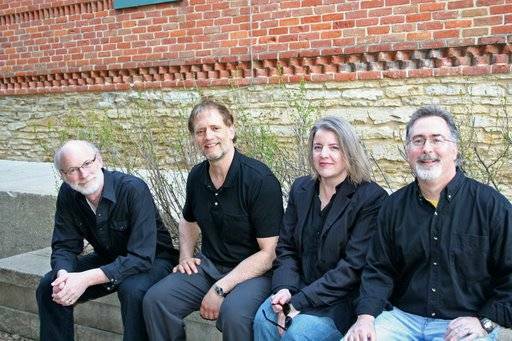 We (Jerry Johnson, Lance Heisler, Wendy Smith and me) are playing tonight (Friday, August 1st) at the Contented Cow. As a special treat, we’ve got musical guest Inga Johnson playing fiddle for family and friends before she heads back to Ripon College. Also tonight, the Norwegian Cowboy is playing at the Tavern Lounge. Head to the riverside of Northfield’s Historic River Inn, the Archer House, to hear his wide range of music, creative pronunciations of foreign languages, and unique brand of locally loved entertainment. Finally, it’s the Merry Wives of Windsor, 7 pm, on the Central Park Stage. John Falstaff, one of Shakespeare’s deepest and most human characters, leads the action in perhaps the Bard’s most popular comedy. He tries to trick a couple of women in matters of love and money and, in a familiar turn, ends up the fool. Falstaff takes it well, accepting responsibility for his actions, laughing genuinely at his own foibles, and inviting everyone back to his place for brews by the fire. Ah, we can all learn something from the fat and happy Sir John. Saturday night, The Merry Wives are again in the Park, Spruce Top Review (musical interpretations that are “familiar and obscure”) is at the Contented Cow, Mark Mraz (Northfield’s “piano man”) is at Froggy Bottoms, and Cam Waters (“understated, expressive singing and simple yet inventive finger-style and slide guitar playing”) is at the Tavern Lounge. Then Sunday, it’s Politics and a Pint, at the Contented Cow. Moderator Bruce Morlan will be out of town so it’s rumored that Proprietor Norman Butler will be assuring truth, justice and the pursuit of happiness for this weekly session.